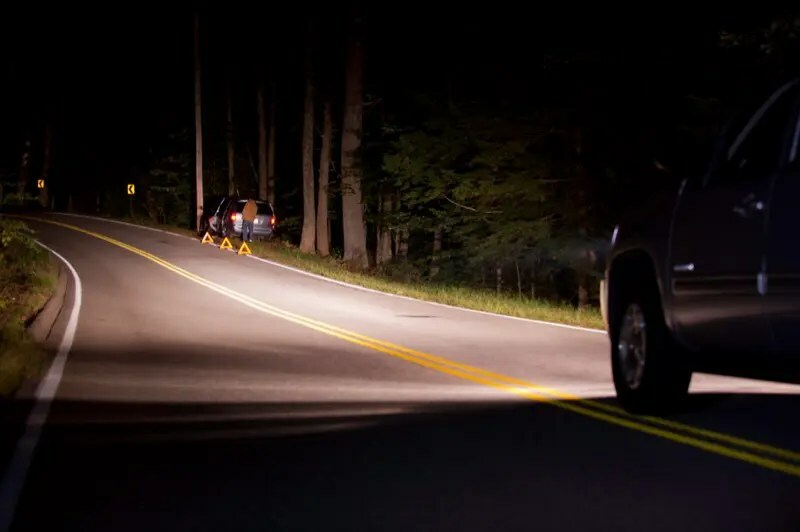 When it comes to driving in the dark, the quality and quantity of lighting you have is paramount to your safety, and the safety of those around you. In recent years, automakers have begun to put significant effort into their lighting systems. From the days of incandescent lighting to upgrades with halogen gases, high-intensity discharge (HID), light-emitting diodes (LEDs) and – most recently – lasers, lighting has come a long way. The aftermarket is evolving quickly as well, so let’s look at some of the options that can make your nighttime drive safer. Factory headlight replacement options are the most popular upgrades available. There are three basic options: incandescent, LED and HID. Incandescent bulbs use a high-temperature filament that glows white-hot when current passes through it. Advances in materials and the selection of gases that are used in the construction of the light bulb have improved efficiency and longevity, as well as increased light output. A few years ago, tinted incandescent bulbs were popular – they gave the white/blue appearance of high-dollar HID kits. However, any time you put something between the light source and what you are trying to illuminate, you decrease the light output. Cool? Yes. Bright? Not so much. The latest rage is LED lights. 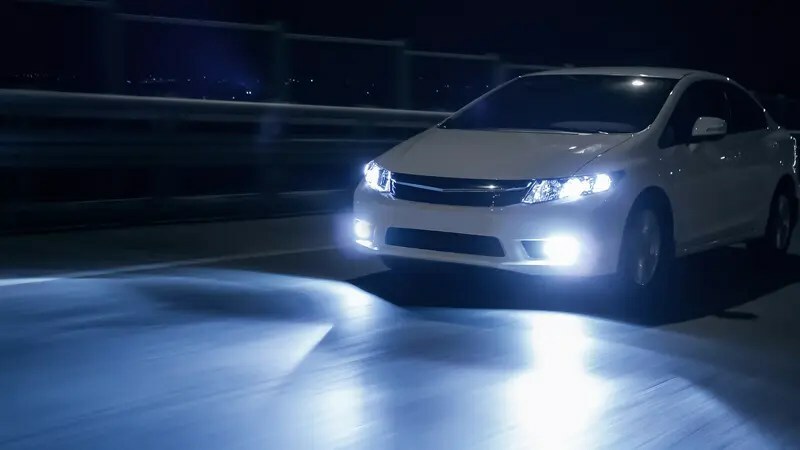 Vehicles like the Toyota Corolla, Acura MDX and new Honda Civic are available with LED headlights. These light sources are very bright. They produce full output very quickly when turned on. In the aftermarket, LED replacement headlight bulbs are becoming more and more popular. The quality of LEDs available is increasing in tandem with demand. However, the light output (measured in lumens) is still a little behind that of HID bulbs. LED lights often cost more, because not as many are being produced – a supply-and-demand issue. LED lights also require external cooling. Aluminum heat sinks, braided metal tabs and fans are common solutions for helping to dissipate the heat generated by LEDs. These can pose challenges regarding installation and available space. The 1996 Lincoln Mark VIII is credited as being the first production vehicle with HID headlights. This system works by increasing the 12V vehicle electrical system voltage up to around 100 volts. This voltage goes to a pair of electrodes in a gas-filled chamber. A steady spark between the two electrodes is what produces the light. However, it takes around 25,000 volts to get the lights to start working. That’s why you get a small, bright flash when you first turn on an HID system. HID lights are among the brightest on the market. The color of the light they produce is closer to that of sunlight, with more blue content than with incandescent bulbs. We should talk about light color, or more accurately, light temperature is rated on the Kelvin scale. Lower numbers, around 3,500–4,500 K have significant yellow and orange content, and are similar to incandescent bulbs. Moving up the scale, 4,500–6,000 K is bluer and closer to sunlight. That said, as the blue content increases, so can the propensity for eye fatigue – blue light can be tiring to look at. You don’t want to go too high for daily use. Bulbs rated at 6,000–10,000 K are for appearance purposes only. The light becomes more purple toward the high-end of the spectrum. These are fine for a show car, but not practical or safe for daily use. Many people believe there is a direct correlation between color temperature and light output. That depends, of course, on the manufacturer of the bulb. The thinking is that lower temperatures produce more light output. Ultimately, the amount of light that is produced will determine how much and how far you can see. Light output is measured in lumens. More lumens means more brightness, which, for a given beam pattern, means that the road will be illuminated better. When upgrading your headlights, it is critically important that you are conscious of the resulting beam pattern. The light that is emitted from the front your vehicle is in a specific pattern – not round like a flashlight. The beam has a flat line through it, ever so slightly below horizontal. This allows the light to illuminate the road without blinding oncoming drivers. The light should also be brighter near the edge of this cutoff, putting more light down the road rather than in front of the vehicle. Too much light in the foreground will cause your pupils to close slightly, reducing how far down the road you can see. Likewise – and this is a great night driving tip – the brightness of the vehicle interior can have the same effect. Keep the dash and radio illumination as dim as possible. That can help you see further down the road. If the new light bulbs you install change the beam pattern, remove them. They are not compatible with your headlights, and they will blind oncoming drivers. This is extremely dangerous and can cause accidents. There are two types of factory headlight assemblies in use today: reflector style and projector style. The projectors are fairly easy to recognize – they have smallish, 2–3” round lenses. Reflectors have a large, molded, mirror-finish bowl behind the light. While one is not necessarily better than the other, you do need to know which you have when you go shopping for upgrades. Aftermarket HID kits don’t typically work properly in reflector-style headlight assemblies. The beam pattern becomes uncontrolled, pointing light into the eyes of oncoming drivers. 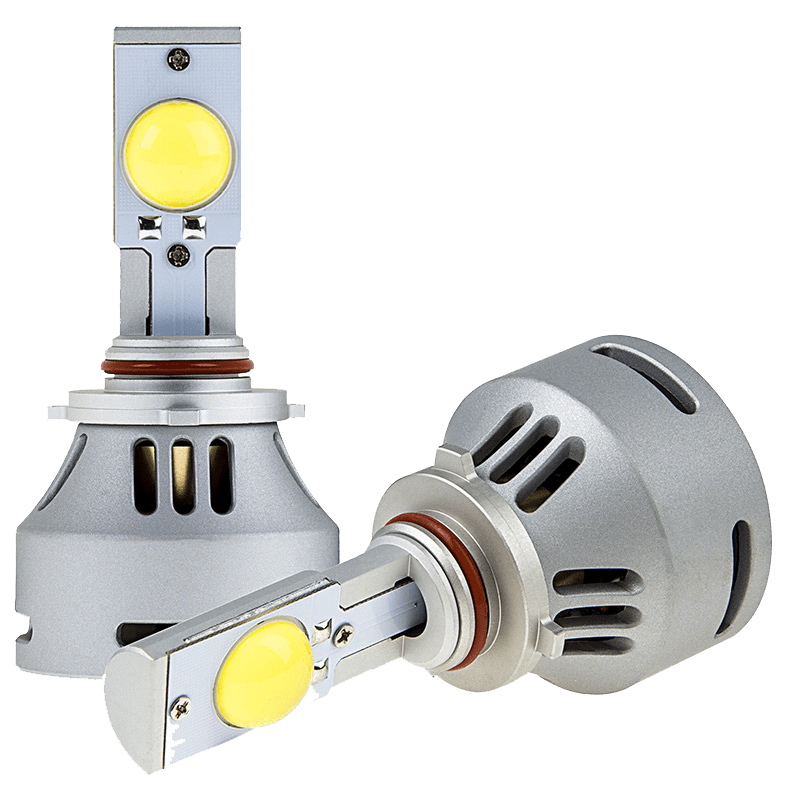 In many cases, depending on the specific design of the kit you choose, you can use an LED upgrade in those applications. In projector-style systems, the shape of the internal reflector is designed to work with either incandescent or HID style bulbs. The position and shape of the light source differs between these two bulb types. You can often get away with putting HID bulb kits in a projector designed for Incandescent bulbs without any detrimental effects, but they may not be quite as bright or focused as an HID bulb in a projector designed specifically for that application. If you are looking for the ultimate lighting upgrade, you may want to contact your local mobile electronics specialist about a retrofit. 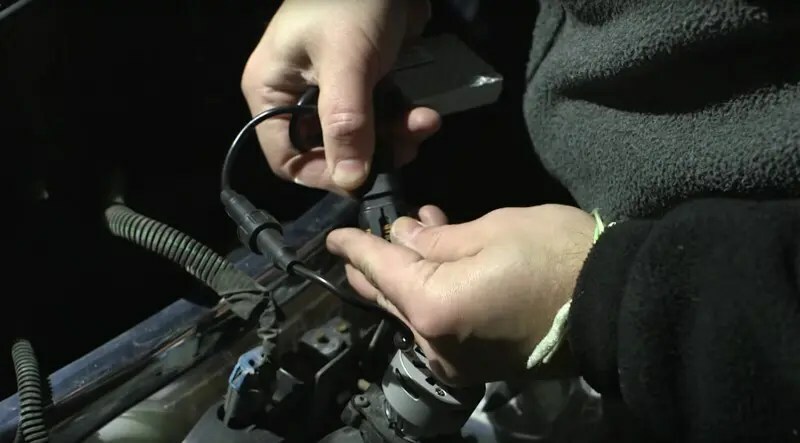 A retrofit involves removing the headlights from the vehicle, taking them apart, and installing new projectors with OEM-quality bulbs and ballasts. Most of these solutions use what is known as a bi-xenon projector. These projector assemblies have motorized shutters that move to produce a “high beam” light pattern. The output of these systems is among the best there is – perfect beam pattern, excellent cutoff and great light output. Some headlights are easier to work on than others, so contact a local specialist for details about your lights. You can also make some cosmetic changes while the lights are apart. The installation of LED halo rings, and painting some of the interior components can have a dramatic effect on the look of the vehicle. When you want to change headlights, wiring is often involved. Many new vehicles have systems in place to detect when a bulb is burnt out. They can also modulate the voltage to high-beam lighting circuits to operate them as daytime running lights. When it comes to wiring, nobody is better than your local car audio specialist retailer. Work with them to ensure that your new light wiring can provide enough current and operates the way it should. Relays, capacitors and load resistors may be required to achieve the results you want. Don’t ever skimp on wiring – it affects the reliability of the lights you install, and your safety is at risk. We want to remind you that your headlights are a tool. They are not toys, and their performance and reliability are of the utmost importance to your safety and the safety of those you share the road with. Lighting upgrades are a great way to improve your safety at night. Drop by your local mobile electronics specialist and discuss your options.